When it comes to a houseboat maintenance report, you don't want to flood and sink your house boat, especially if you're not there. Here's an excellent example of a new houseboat owners situation after buying a used boat. I have a small company on a 40,000 acre lake in North Central Arkansas. I do some work for the Army Corps of Engineering. I was called by the corps about a sunken houseboat, I went and checked on the boat before I returned with equipment to recover it. I was able to piece together the mishap with information from the owner. This was a new houseboat owner who bought this 1970, 34' houseboat at the end of the season, The owner had tied it beside a private dock with intentions of having it removed from the lake to start a remodel. However time gets away from you and before you know it, it's the Holidays and then January. In North Central Arkansas during the winter the temps drop low, this year they got as low as 5 degrees above 0. As a new owner they were told that the seals on the outdrive needed to be checked and replaced. The owner was going to have this all done when it was pulled out. However the batteries got rundown by trying to run the bilge pumps and the cold temps. It was not enough, and the engine compartment filled with water and so the whole boat was filled which caused it to sink. All this simply because the owner got busy with other things, and forgot that the boat needed to be pulled out or for what ever the reason. All it would have taken was to at least have someone check on it until it was removed, or to make sure that it was plugged into shore-power. It is removed now. So have your boats checked on through out the winter, so you will be ready to start the next boating season without problems, even if you have insurance, but what a hassle, and total waste of your time having to deal with insurance claims, adjusters, and the loss of a boat and the boating season. And even if you have good insurance you always lose some money on the settlement. 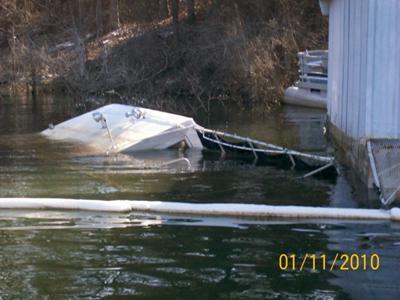 Well that's all for now, so please boat safely this year and hope for a early spring, Gary Edwards, Fairfield Bay AR. You can now install a simple & inexpensive system to watch out for high bilge water levels. So whether you’re sleeping, or away from the boat, or gone for the week, you can be notified of a dangerous high bilge water level. Well Gary, thanks for taking the time to post this excellent example of a typical houseboat sinking. When it comes to maintenance and keeping an eye on your boat, there is some small vital things that need to be done. Since I teach boating safety with the Power Squadron and work with the Coast Guard Auxiliary, we can't stress enough some of these very important factors. Unfortunately some boats can sink if they are not maintained or looked after. Lastly, hopefully some of our readers and visitors will share and post comments about their houseboat maintenance tips, or sinking houseboat experiences. Feel free to use the "Click here to post comments." link found near the bottom of this page. I bought an old (1977) handmade houseboat. It has no engine and was built on a 50 foot steel hull. It's a great, cozy little home for an older, single person and I love it, but there are things - logical things - that the previous owner explained to me and figured maybe someone here would take to heart. I was told to turn off the marine pedestal's water to the boat if I'm going to be gone for the day (or longer). It just made sense - a line springs a leak and you've left the water on... a disaster in the making, right? So just remember to turn off the water when you leave for the day and turn it on when you come back home. One less thing to worry about while you are away! The water in your front hold is more than likely due to the fresh water plumbing. We had the same problem (twice!) and finally got the correct material for a complete re-work and solved the problem. I know of at least two other houseboaters who had the same problem. My question is, is there not any safety mechanism to guard against catastrophic boot failure? I fully understand the importance of maintaining the boots, but my boat is 60' and I can't even find anyone who can haul it out to have this maintenance done. I do have a high-volume 120v pump in place, as well as a battery operated one, both with floats. Isn't there ANYTHING that could be done as an emergency stop-gap procedure? It seems to me there should be a way to build a "dam" inside the engine compartment, or a shell outside the outdrive to prevent flooding. My husband and I have a 30 ft. 1969 houseboat on the Delta in Tracy, Cal. We have a leak in the transom unit and we need to have it pulled out. Does anyone have a hydro hoist that would support our boat, or know someone that would let us rent their hoist just long enough to fix it? Or if anyone knows of a reasonablly priced place to have it pulled out, it would help us out a lot. We are not rich people, rather a younger couple that love the boat life and would break our hearts if we loose our boat. If anyone can help us at all we will be so grateful. Who ever told you NOT to pull your steel hulled houseboat because it could damage the hull needs to be totally ignored. 2" of water every week is NOT from condensation. I would suspect a thru hull fitting seeping. By all means have the boat hauled by a competent marina with the proper equipment and have it inspected. 2" of water is nothing compared to 20' of water should this leak continue. Better safe than sorry. Steel Houseboats - boat hull leaking or not? We have 1972 35 foot Bordeaux houseboat. We have had it for 3-1/2 years. We have to pump water from the front compartment once a week. It usually collects about 2 inches of water. The back compartment where the batteries, gas tanks, water tank, etc. is always dry. We initially thought that because it was parked in an open slip, that rain water going down the sides was seeping in. We now have it in a covered slip and still have the accumulation of water. We have been told by several old time boaters that it is just the condensation that is created from the steel hull, it's just that 2 inches a week seems like a lot! We have also been told not to pull it out of the water due to the chance of damaging the hull and then for sure having to replate some or all of it. I guess we feel like if it only collects 2 inches a week and we keep it pumped out, that we are not in too bad of shape. Any thoughts or recommendation on this situation would be greatly appreciated. My wife and I were parked in the perfect spot last weekend in our 1969 Drifter steel hull houseboat. We got up next morning to find a small wet spot in the floor, I blamed it on the dog but wifey said no way, much too wet for that little guy. She was right, I looked in the front hold and everything was afloat. Time to spring into action, I first dug out the new pump I just bought (thank god) and fired the generator and started pumping. Wifey looks in the compartment and says she sees daylight coming up from below... this can't be good I thought so in I went and sure enough there was a 1/2" hole in the hull. I laid there with my finger in it for a few till I came up with a plan, I snatched the key float and crammed a small piece of the foam in the hole and it held. Next we had coffee and breakfast, never was too good on an empty stomach and came up with a plan. I took a SS nut, bolt, and 2 washers from the new ladder I had just installed, and fashioned a couple of rubber washers from something wifey found in a drawer. I went to the hole pushed the bolt through without even removing my temporary plug then called wifey to hold it while I went in the water. Luckily we were near a shallow water beach so I positioned the boat so I could stand and place the other rubber gasket washer and nut on the outside of the hull and snug it to make a pretty decent seal. I guess old man rust is telling me something, looks like I'll need to pull her out and have some work done so I can sleep at night. The hull looks pretty good and this hole was pretty clean so I'm a little confused about the cause but I guess it was just a rust hole. Any thoughts would be helpful. Sinking, sank, and sunk houseboats! My first boat was one I raised after a hurricane many, many years ago. 1958 to be precise! I have since raised to many boats to keep track of. Once in a while I run across one in particularly good shape and keep it for myself. I have had three very high quality boats that people lost due to complete ignorance or because it had to much insurance on it and the owner wanted to turn it into a liquid asset. I once called an insurance company with proof that a boat was scuttled and they blew it off as more trouble to prosecute, than to not pay the claim than to pay the crook and be free of the boat and him. The insurance company sold it back to the owner for $500 and I bought it from him. It was a 40 foot Chris-Craft. I bought new engines, did a bunch of work and run it for several years. Sunken boats are a good source of good boats if you can do the refitting and refinishing. The foolish owners who are ignorant of keeping the boat afloat will learn over the long run. We all made mistakes while learning to be boat owners for the first time, so how can we judge them for common mistakes. we all know the proper way to protect our boats but we were not born with that knowledge. This guy learned an expensive lesson but I'm sure we have all learned things that cost us dearly. ie; I went off on vacation after running my boat some 50 miles to a friends house for safe keeping. Unknown to me, the engine oil cooler was starting to leak and let a lot of water into the engine. If I had checked the oil after parking the boat for 6 weeks I would not have lost a $7,000 engine. By the time I came back the engine had locked up from having water in it. I checked the oil before leaving the dock on the 50 mile run but did not check it when we arrived. Who ever checks the oil after such a short trip? I now check the oil even after running the engines for weekly warmups. Hopefully I'll never find milky oil or an engine full of water from a bad manifold. Well Russell, I couldn't have said it any better, and we all learn through some of life's trials and tribulations. The general idea is to learn and not repeat the same mistakes. This is a case of irrresponsibility. Even if you have no experience you don't park an expensive purchase without checking on it from time to time. People like this give the boating public a black eye. It would be much better if these people would seek other hobbies.